SF SAID: Interesting question about Varjak Paw film! Interesting question about Varjak Paw film! We're huge fans of Varjak Paw! (Books 1+2) And can't wait to read your new book. But please could you tell me if there is an animation film of Varjak Paw. My daughter and her friends are nagging me stupid about it! They say they've found a trailer on Utube - but can't locate the actual movie. Please help! Thanks so much and really well done for writing two of the best kids books ever! Like the Godfather parts 1+2! First of all, thanks so much to you and your daughter, SH! That really means a lot. The answer is that there is no official Varjak Paw film... yet. All the animations, trailers and so on that you see on youtube are unofficial fan works. Personally, I'm glad they exist - but neither Dave McKean nor I were involved in making them. The problem is, it's much harder to get a film made than it is to get a book published, and though we got very close a couple of years ago, it's never quite come together. So at present, there is no official Varjak Paw animation... but I hope that one day there will be! I love the style on that poster! I hadn't thought of it before, but varjak paw would make a great animated movie and if it ever comes together I'd love to watch it. Great poster! Wonderful book! It would be a fabulous movie. Hopefully it will happen someday soon. Thanks so much for telling us the score. And really looking forward to reading your new book. Thanks again. Thank you so much, SH! And thanks again for the question - it's great to know that there are people out there who want to see a Varjak Paw film! I know this sort of sound stupid but I sort of imagined a book like this to be a action adventure not cartoon but like animated cgi and all that.. I'm really enjoying the book, it is my favourite book ever! Is there a varjak paw 3? Wow, that's an interesting question! I will definitely write as many as I can, but I want each one to be as good as it can possibly be, and that takes a lot of time and a lot of drafts. It's much harder work than I ever imagined! So far I've only managed three - the two Varjak Paw books, and Phoenix. But I'm currently working on the first draft of my fourth book, and I've got plans for several others, so hopefully there'll be quite a few by the time I'm done! Can you say what is your fourth book? I have read Varjak Paw with my class of 8 year olds and they were absolutely entranced with it. We have done so much work from it - writing and drama and would absolutely love to watch a film version. Here's hoping! That's great to hear - thanks so much for your kind words, and please give your class my best wishes! Here's hoping indeed! pages of Varjak Paw i fell,in love im honestly saying whithout exaguration (probably spelt that wrong) that varjak paw 1 and 2 are the most amazing, inspiring books ive ever read and more books or movies would make my life! sf said you are the greatest person ive ever known. Thank you. I want to see the film sooooo bad! Is it out yet? Also could there be a 'The Outlaw Varjak Paw' movie? I finished the book today at school. 11/10/13 Is when I finished it. I can't wait to read the first book. This is EpicWolfie from FeralHeart, peace out. In the meantime, I hope you enjoy reading Varjak Paw as well, and my new book Phoenix, which has just come out. There is actually a short trailer film for Phoenix, which you can watch here! Hello SF Said, my name is Jasmine Leigh and I am your biggest fan on your Varjak Paw books, I have read 1+2 at least 1000 times. I LOVED them so much I even named my two cats Holly and Varjak Paw. I think you are a very very gifted book writer and I hope there will be a 3red Varjak too. I also love your book Phoenix too. Please write back. Hello Jasmine! I can't thank you enough for leaving me that incredible comment, it really means a lot to hear lovely things like that! Don't worry, there will definitely be a 3rd Varjak Paw book one day; I wrote a bit about it here. In the meantime, which one would you say is your favourite of my three books so far? Thank you so much again for taking the time to say hello, and please say hi to (your) Varjak & Holly from me! My daughter & I love Varjak Paw (& sequel) more than you can imagine. It is a fabulous book & so is the sequel. I see Phoenix is out. We will get it; but, when you are ready, we really would like to read another Varjak book. The characters are wonderful & it is well written. 5 stars to Varjak. And there will definitely be a third Varjak book one day - I wrote a little bit about my idea for it here. I would so love it to be a move and so would my class we are up to ch 16, but I finished it at home, wow they are all on the edge of their seats! Someone make a movie wtf! That's so great to hear, thank you so much for letting me know! I agree, it would make a great movie... hopefully one day, it'll happen! I loved reading Varjak Paw and when I found out there was a sequel, I got it the next day and read it. That was 2 years ago. I have been waiting for a third book for a long time and recently I heard that there might be a film. I hope that the third book will be published too, and maybe you can write a short story about Jalals history. Thank you so much, that's great to hear! I hope there will be a film one day; if there's any news on that front, I will post it here. I will definitely write the third Varjak Paw book when I'm ready - I wrote a little bit about it here. I'm not planning to write a short story about Jalal's history, but if that is something that you would like to write, I would be thrilled and honoured! I love it when readers make their own stories using my characters and worlds. In the meantime, I hope you'll try my new book Phoenix. It's not a Varjak book, not even cats this time – but if you enjoyed my other books, I hope you will enjoy it too; the underlying themes are very much the same, and it comes from exactly the same place. Thanks again for your kind comment, and keep the Way alive! Thank you very much for your visit, and your comment. There isn't a movie as yet, but there is a second book - The Outlaw Varjak Paw. It picks up where Varjak Paw ends; you can find out more about it here! Please say hello to your class from me - I hope they enjoy the read! I am also reading Varjak Paw to my class of Grade 4's, and they are absolutely loving the book. We were all hoping that there would be a film version to compare the book to at the end of this unit. They will be excited, however, to discover that there is a sequel...and I will definitely be purchasing one for our classroom library! Thank you so much for your kind comment! It's wonderful to hear that your class are loving Varjak Paw. Please say hello to them for me, and I hope they enjoy The Outlaw Varjak Paw as well! I love Varjak paw! It is the best book I have ever read! I really hope you write a third! In the third I don't think he should be an old cat. I think varjak should still be an adult but go on an awesome adventure! I really do think that there should be a series! Each one a new adventure as an adult cat! Maybe in the 10th or 15th book will be the last and in the last book he will be an old cat! I have only read the first book so far. Today or tomorrow I will buy and start reading the second! I read the first in school because I got it in the school library. I was sad to give it up. But I was also happy because i passed it to my friend that sits next to me so he could read it! He loves it so far! I also have a few more friends that want it! Well I guess that this is all I can say for now! Thank you so much for your lovely comment, I really appreciate it – and thank you also for passing Varjak Paw to your friend and spreading the word! I think I will only write three books about Varjak, but if you would like to write more stories about his adventures, I would be absolutely honoured! sorry about those other comments they got messed up. I think Varjak paw is the best book ever! I am looking forward to the 3rd book! Also to make a 100% convincing CGI talking cat just copy Narnias Aslan! Just remove the mane, change the color of the skin and then alter the teeth. Hey presto a toatally convincing CGI talking cat! I really think the should be 4 vajak paw boks in the 3rd one hes an adult and has kittens and in the 4th one he is an old cat. please respond for I would like it if you didi this. I really enjoyed vajak paw and I am looking foward to the other books! Thank you very much for your comment! I'm glad you enjoyed Varjak Paw and The Outlaw Varjak Paw, and I hope you enjoy Phoenix too - please let me know what you think when you've had a chance to read it! Thank you very much for your kind message. I'm glad you enjoyed Varjak Paw and are looking forward to the other books. At the moment, I don't think I will write more than 3 of them, but who knows - anything is possible! Also, one last question. Is there an official trailer for any Varjak Paw film because I want to know if there Is any proper example of it out there? Hi again Danny! There isn't an official trailer for Varjak Paw, because we haven't made one (yet!) All the ones you can find out there are unofficial. 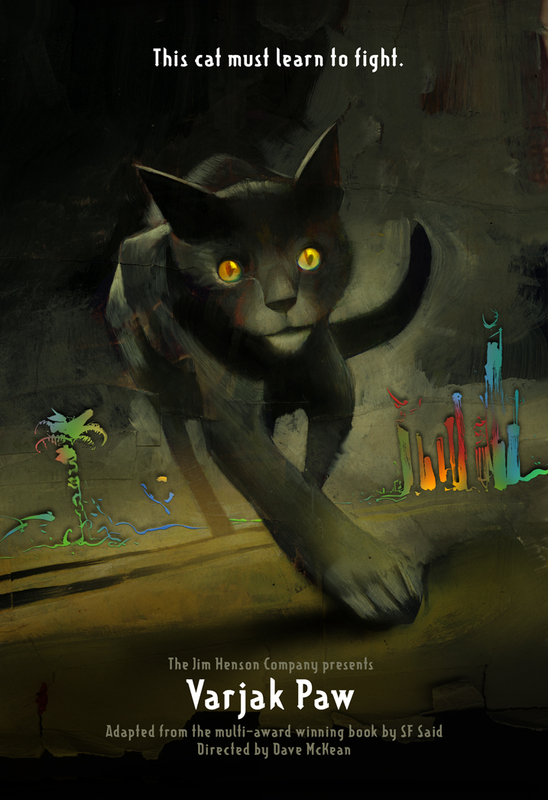 The only official Varjak Paw film material is what you'll find on this site, and on Dave McKean's sites. I think he posted some of his artwork for the film on his Facebook page, back when we were working on it in Hollywood in 2010. Do you think you might do a second pheoniex book where Lucky returns? I would really like that. Also wich book are you writing now? Thank you! We're doing our best – I hope it will happen, one day! I'm a massive fan of your books and Varjak Paw has to be one of my favourite books ever to read and the Outlaw of Varjak Paw. I'm just wondering would there be a animated film of this book as I saw a poster and I honestly think this would be an amazing film. I for one would be one of the first people to watch it. I understand that it is harder to get a film published, but if it was, especially for your fans such as myself, it would be a huge success! And i really hope there is a way to have Varjak Paw as an animated film. Thank you so much for your lovely comment! Sorry for the delay in replying - I've been away on a research trip for my next book, and have only just got back home. As you say, it is very hard to get a film made, and we've come close a few times. But I hope there will be an animated film of Varjak Paw one day. I will certainly blog and tweet about it if it does happen, so keep looking out for news! In the meantime, it means a lot to know that you still enjoy my books in your 20s. Have you come across my new book Phoenix yet? It's not a Varjak Paw book, but it very much comes from the same place. It's available now in the UK, and will be published next year in the US by Candlewick. varjak paw is the best book in the universe. i have not read the outlaw varjak paw yet, because neither the library or any stores have it, but i am dying to read it. and PPPPPPPLLLLLLLEEEEEAAAAAAAAAAASSSSSSSSSEEEEEEEE make a 3rd book. i don't want to never read about holly and varjak again. i think i'd die. Thank you so much for your lovely comment! It really means a lot. I hope you enjoy The Outlaw Varjak Paw as well – you can always order it from my publishers via the links on this page. And there will be a third book about Varjak one day – I wrote a bit about my idea for it here. I loved "The Outlaw Varjak Paw" I am a cat freak, and at school when I finished it I said, I finished it? Aww. Nice work SF Said! Thank you so much for that fantastic comment, that's great to hear! I'm really glad you enjoyed The Outlaw Varjak Paw. Have you had a chance to read Varjak Paw as well? I love your book Varjak Paw! I have read it and it's really good. I am reading it again because I really like it. Any new updates on a movie for Varjak Paw? Is there a movie yet? I've seen the trailer, but it might be one of the old ones, so I wanted to know if there is a real movie. I'm looking forward to reading the next book when it comes to my school library. I live in a country where there aren't many books in English, but I can't wait to read it. Thank you so much for your message! Which country do you live in? There isn't a movie yet of Varjak Paw, but there is a new possibility that it might happen one day. I'll definitely write something about it if it does. In the meantime, the various trailers you can find on the internet are all fan works. There's also a possibility that there might be a movie of my new book Phoenix. To give you an idea of what it might be like, here's a link to Dave McKean's fantastic book trailer. Hello. Huzaifah again. I thought I'd make it a separate post... why won't you write more than 3 Varjak Paw books? Thank you for your message! I wish that writing books was easier for me, but each one takes me many years, because I want them all to be as good as they can be. This means that I can't write a book if I don't really have a story for it - that wouldn't make a very good book! I can only write the books that I can imagine stories for. And at the moment, I can only imagine three books about Varjak. I wrote about my idea for the third Varjak book in this blog post. I don't think Le Guin ever thought she would write so many books about Ged, so perhaps I will end up writing more about Varjak one day, if I ever find more stories for him. But at the moment, three is what I have. Of course, if anyone else (like yourself) wanted to write another story about Varjak, I would be totally honoured and thrilled. I've seen some amazing work that people have done with my characters and my worlds. So if you want more stories about Varjak - perhaps think about writing one yourself? Some of the first stories I wrote at school were based on TV programmes I liked; it's a great way to learn how to write! Thank you so much! That's great to hear. Have you had a chance to read The Outlaw Varjak Paw yet? Hello, I would like to tell you how much I love Varjak Paw and what an amazing writer you are!! The second book was honestly the most amazing book I've ever read! The Outlaw Varjak Paw is my favorite book ever! And I've been dying to ask, will there ever be a third book? I've been hearing rumors, but I'd like to know for myself. And if so, will Holly's mysterious ice blue eye be explained? Will Holly and Varjak ever have kittens? It's been a long time and I always wonder about the next chapter in the beloved hero's lives! I'm not trying to offend anyone, but I like to think of myself as your biggest fan! Sincerely, an anonymous person who loves your stories. Thank you so much for your amazing message! That really means a lot to me. I don't find writing easy - the first Varjak book took 5 years, and the second one took 3 – but all the hard work feels worthwhile when I hear from a reader like you. In the meantime, have you read my new book Phoenix yet? It's not about Varjak, or even cats this time – but it very much comes from the same place, so I think if you enjoyed the first two, you'll enjoy it too!